21" x 16.5" x 16"
The Bushong creation myth is a complex story of conflict and resolution. As in many creation myths throughout the world, its characters represent more than individuals. Each myth is a representation of humankind as a whole. The cast of characters varies from culture to culture based upon context, that is, the environment from which the myth emerged. In the Kuba culture three main characters play a role in this myth: Mukenga (also called Mwaash a Mbooy), Bwoom, and Ngaady a Mwaash. Mukenga is Woot, the first human, who represents the mediator between the ruler and nature. The trunk-like form on top of the elaborately decorated mask references elephants. The elephant symbolizes strength and prosperity -- strength from the animal's obvious physical characteristics and prosperity due to its economic importance in the early ivory trade. 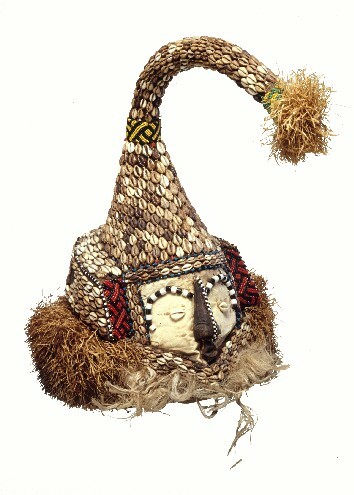 The cowry shells adorning the mask signify wealth (cowries often were used as money). The colored glass beads signify good fortune (red), high rank (blue), and faithfulness (white). Owned by the king and often buried with him, a mask such as this represents the king's divine power and position in the royal lineage.